This Pumpkin Spice Granola is a delicious way to savor the flavors of fall. Hearty oats, crunchy walnuts, dried cranberries and fall spices give this granola both texture and flavor. It’s simple to make and perfect to eat by the handful, with milk, or on top of yogurt or ice cream! The first day of fall is officially upon us! Even though it’s actually tomorrow, it will begin to look a lot like fall on my blog today. With a name like Pumpkin ‘N Spice, I have to live up to the expectations, right? I am so excited to finally be sharing all of my pumpkin and apple recipes with you! While baking with fall flavors is my absolute favorite, I wanted to wait until it was closer to fall to reveal my creations. Although, I do have a confession to make: I’ve been baking up pumpkin, apple, and other fall-like treats since the beginning of August! Creating my own recipes, testing, retesting, and trying some tried and true favorites has been filling up my kitchen with wonderful goodies. You could say I have pumpkins coming out my ears! Which means that I have a whole slew of pumpkin and apple goodies comin’ your way! So to kick off the start of fall on Pumpkin ‘N Spice, I thought I would throw a healthy and delicious snack your way: Pumpkin Spice Granola! A crunchy and delicious granola, flavored with pumpkin, spices, maple syrup, brown sugar, and pumpkin seeds will have you snackin’ on this tasty treat all day. I’ve love making my own granola. It’s less expensive than the store-bought stuff, delicious, and healthy. So naturally, Pumpkin Spice Granola was one of the first fall treats that popped into my head. And guys, this Pumpkin Spice Granola is insanely delicious. I don’t lie, so trust me! I’ve made this batch several times, each time experimenting with just the right amount of spices. Well, I finally perfected it! It has just the right amount of pumpkin flavor, combined with the perfect amount of sweetness. 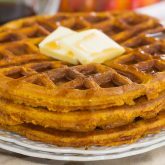 The brown sugar and maple syrup enhance the pumpkin flavors, while the walnuts and pumpkin seeds give it an extra crunch. This Pumpkin Spice Granola is amazing right out of the bowl, sprinkled on some yogurt, or as a topping to your morning oatmeal. I give you my guarantee that you’ll love it just as much as I do! Looking for more pumpkin treats? I’ve got you covered! 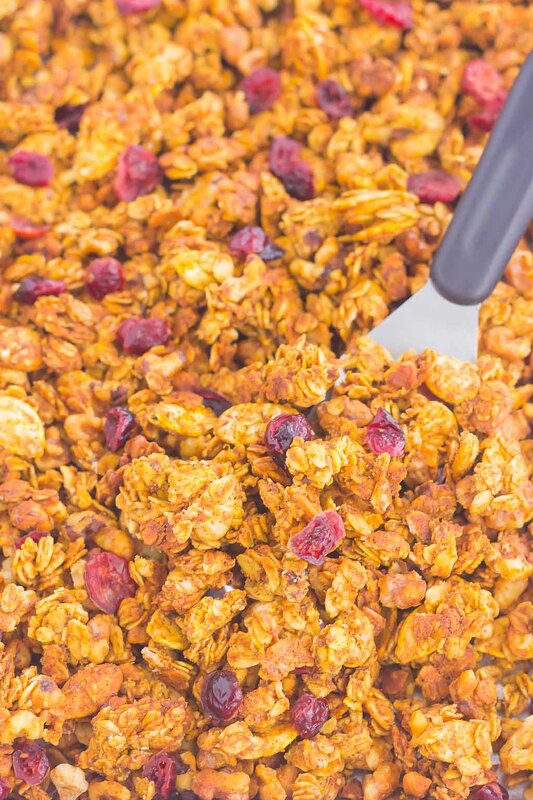 This Pumpkin Spice Granola is a delicious way to savor the flavors of fall. Hearty oats, crunchy walnuts, dried cranberries and fall spices give this granola both texture and flavor. It's simple to make and perfect to eat by the handful, with milk, or on top of yogurt or ice cream! Preheat oven to 350F. Line a large baking pan with a silpat mat or parchment paper. Set aside. In a large bowl, combine the oats, walnuts, pumpkin seeds, pumpkin pie spice, cinnamon, and salt. Set aside. In a medium bowl, whisk together the brown sugar, pumpkin, coconut oil, and syrup until thoroughly combined. Pour the pumpkin mixture over the oats and stir well, ensuring that the oat mixture is entirely covered. Spread granola evenly onto prepared baking sheet and place into oven. Bake for 25-30 minutes until golden brown, stirring every 10 minutes to avoid burring. However, if you like granola clusters, do not stir while cooking. This will ensure that you get those large, crunch clusters. Remove from oven and let cool completely on baking pan. Toss with dried cranberries and keep covered in an airtight container. Granola will keep in an airtight container for up to one month. This looks wonderful Gayle! I just made granola on Friday and it is already completely finished (I did gift over half of it, though!). 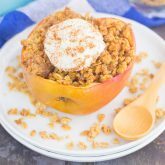 I can't wait to try your Pumpkin Spice Granola this fall - it looks heavenly :) Pinned onto my Pumpkin Board! Granola definitely doesn't last long in my house, either! But especially the pumpkin kind, it's amazing! I hope you love it, Ceara! And thanks so much for the pin! Finally, a recipe that ties into your blog's name! And it's a very worthy recipe. I don't think I'd be able to stop eating this. It's definitely in the land of addiction. Took me long enough, right?! :) This granola is so addicting! I've eaten it plain, as a cereal, over yogurt, and even ice cream! What a great idea! I can definitely see myself eating this granola ALL fall long!! Thanks, Sue! It's definitely perfect for the season! 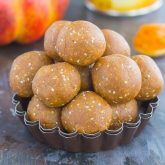 You nailed it, with a blog title of Pumpkin N Spice, I totally had high expectations for um, pumpkin and spice recipes =) And you didn't disappoint. I love this pumkiny, spicy, walnut-y granola. Fall yumminess! My comment got cutoff:( I love this granola! Granola is great to make at home and it's so fall like! Happy Monday Gayle! Thanks so much for the kind words, Bri! I've already gone through one batch and am planning on making some more this weekend! Have a great Monday, too! Gayle, this granola sounds fabulous! I love that its pumpkin pie spiced and it has pumpkin seeds in it ;-) YUM! Pinned! The pumpkin seeds are delicious in here, Michele! They have the pumpkin seasonings on it and are nice and crispy from the oven. Thanks so much for the pin! You know what, I have never made homemade granola before. But I am going to make this recipe my first. I definitely think this recipe lives up to your blog's namesake! And I am in love with that cute pumpkin bucket in the pic!! I hope you love this recipe if you try it, Renee! And thanks so much for the kind words! This is going to be a surprise for my daughter, she loves pumpkin and granola! I hope your daughter loves this, Amy! It's so full of pumpkin and fall spices! Looks amazing! The pumpkin seeds make a nice fall-like addition. 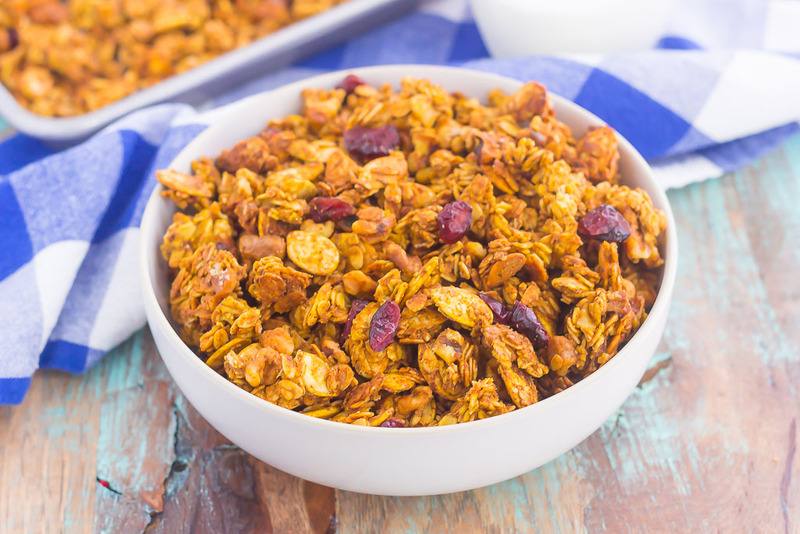 This granola looks like the perfect fall breakfast! Definitely pinning! Thanks so much for the granola love and pin, Ashley! I hope you love it! Hi Gayle, This sound absolutely delicious! Can't wait to try it! WHAT?!! This looks so good!! Gotta love pumpkin spice stuff this time of year! I just bought some pumpkin spice yogurt... this would be PERF with that!! Hello healthy Fall!! I've been looking for pumpkin spice yogurt everywhere, Cailee! I'm sure this granola would be so delicious sprinkled on top of that. I need this granola stat, Gayle! This would be the perfect way to start my day. Pinning! I think you would love this granola, Marcie! Such a warm and inviting fall flavor. And thanks so much for the pin! Ohhh yay for it being officially fall! This looks terrific and your photos are gorgeous! This granola would be perfect for just about any meal! And I the crunchiness and pumpkin flavors, too. Thanks so much for the granola love, Cate! This looks highly addicting! Love that little tin you have there - adorable! Oh yeah! Pumpkin season is here! I am so excited. I can't wait to try this too and I love that you have used coconut oil. Hooray for pumpkin season! :) The coconut oil adds a healthier touch and doesn't flavor the granola, which I love. I hope you enjoy this granola if you try it, Dannii! I love that little tin, so cute! And you can't go wrong with pumpkin flavored granola. I'll take it for breakfast and as a snack. It looks incredible! Pumpkin granola is definite the best! Thanks so much for the granola love, Ashley! this looks awesome Gayle, pumpkin granola is on my "to make" list as well during fall! I love that you used coconut oil, I prefer that too in my homemade granola! Thanks, Manali! I love using coconut oil whenever I can! I hope you love this granola if you try it! Yum yum yum, in my TUM TUM! I would definitely over eat this stuff, LOL! Thanks, Gigi! It turned out delish! Pumpkin seeds in the granola is SUCH a good idea! My husband is obsessed with pumpkin seeds. Obsessed! He will love this. I love the pumpkin seeds in this granola because they get flavored with the pumpkin and spices, so they're extra tasty! Thanks, Meg! I've tried making my own granola before, and it's a skill that I had to work on. It took me a few tries to get this right, but it turned out delicious! Beautiful!! I love pumpkin and I love granola! Isn't the change of season such a good feeling?! I love bidding one season farewell and welcoming another, it is so refreshing! I love fall and everything that goes along with it, Annie! All I can think about is how AMAZING this would be stirred into some creamtop maple yogurt. Like.... it might be so good it hurts. I need to make this stat! That sounds amazing with the maple yogurt, Cheryl! What a great idea! Thanks so much for the kind words and for stopping by! Home-made granola is the best! It's sometimes tricky for me to make, but I finally mastered this recipe! :) Hope you love this if you try it, Danielle. And thanks for compliments and pin! OMG this sounds insanely delicious!!! 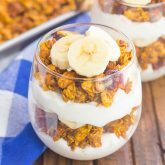 I make granola all the time but with the pumpkin spice and list of healthy ingredients this is sure to be a hit at my house or to even place in a jar to give as gifts. Great recipe. Thanks for sharing. That's a great idea to make this as a gift, Vicki! Thanks so much for the kind words and for stopping by! Yum! I loveee making granola at home - so much cheaper and better for you! This pumpkin spice version sounds awesome! Can't wait to see all the other recipes you created! Thanks so much, Ashley! 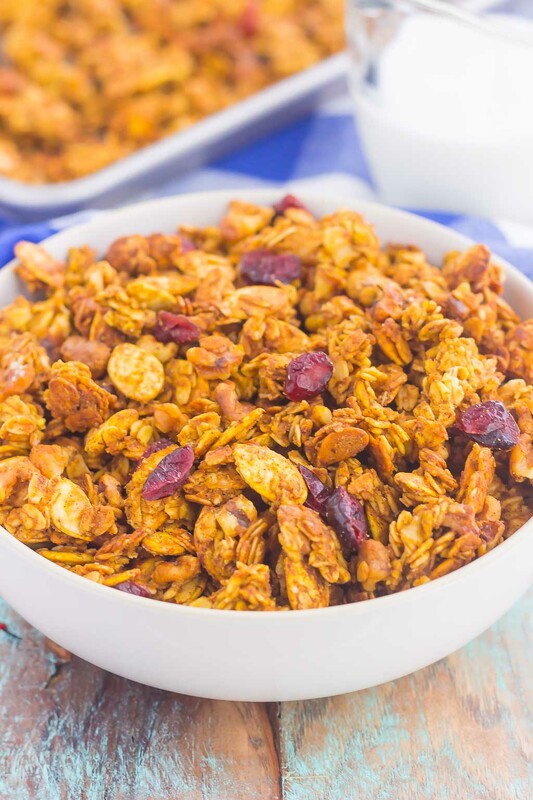 This is one granola recipe that I'll be making over and over again! Gayle , I bet you are so excited about fall , with a name like Pumpkin and Spice who can blame you!! This Pumpkin Spice Granola looks so good! Pinning! I'm definitely excited it's finally here! Thanks so much for the granola love and pin, Katie! This is definitely one of the BEST granola recipes. And since I am a huge fan of pumpkins, this is surely a must make. Thanks so much for the sweet words, Angie! This pumpkin granola turned out amazing, if I do say so myself! :) If you love pumpkin, then you will adore this! Thanks for stopping by! Yay for pumpkin! This gorgeous granola TOTALLY describes your blog! Love it. :) P.S---I am totally digging that adorable little fall bucket---so cute! Thanks so much for the kind words, Sarah! I thought this was the perfect recipe to start the season off with! Pumpkin granola is a wonderful idea for fall, Gayle! I love that you stirred in real pumpkin and all those beautiful spices. You just need a nice Starbucks pumpkin latte (or homemade version) to go with it! You are so right, Helen! I definitely need a pumpkin latte, and then I'm all set! Thanks for the kind words! Yes you do have to live up to that name! This recipe looks like my kind of snack! Love love love the coconut oil, maple syrup and pumpkin combo. So fall-inspired and inviting. I can only imagine how good this smells while it's baking. Yum! Hopefully I'm off to a good start! :) I love using coconut oil whenever I can. And the pumpkin flavors and spices go so well together. Thanks for the kind words, Allison! Me either, Chelsea! I have been baking with so much pumpkin lately! Thanks so much for the granola love and pin! Wow, you are so organized! I am pretty much a fly-by-the-seat-of-my-pants kind of blogger...I wish I could get ahead on my posts! Love this granola! Looks like the perfect breakfast (or snack). Can't wait to see all your pumpkin/apple recipes, Gayle. Thanks so much for the kind words, Denise! I'm so excited that fall is finally here! 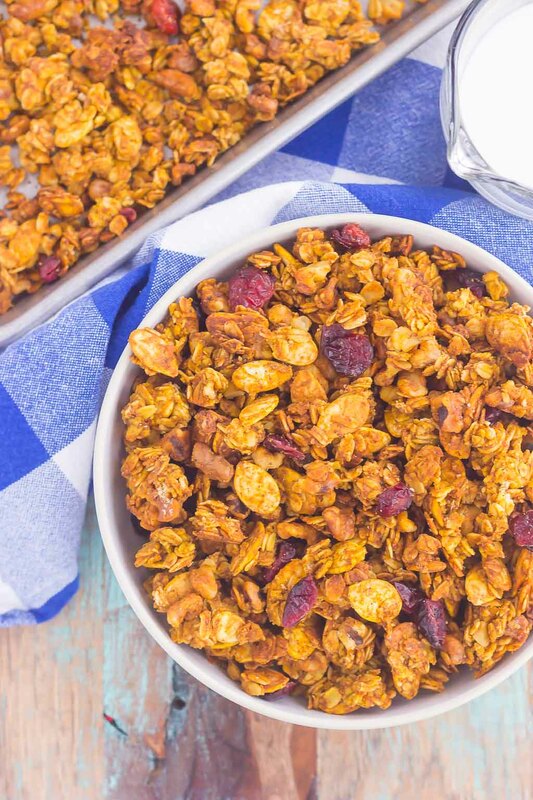 You definitely have to try this granola, Olivia! I think you would absolutely love it! Now that it's officially fall, I'm like "bring me all the pumpkin spice." Yep, this is your season! ;) This granola has me seriously drooling. Awesome pics, lady! Ha ha thanks, Leah! I can't wait to make this granola again in a few days, it's so delicious and full of fall flavors! Thanks so much for the kind words and for stopping by, Jen! Yay for fall! This granola sounds like the perfect fall treat or breakfast. Love the picture with the granola in the pumpkin can! This should be your blog's logo :p. I am loving the sound of this granola! I will keep that in mind! :) Thanks so much for the granola love! Can't wait to try this! How much pumpkins seeds do you use? I don't see it in the recipe. I've never used pumpkin seeds in a recipe. Can you but the in the supermarket? Hi Lori! I'm so sorry, I did forget to add the pumpkin seed amount on the recipe. I've updated that now! :) I used one small package of pumpkin seeds that I bought at the grocery store, which was about 1 cup. But feel free to use as many as you want. You can find pumpkin seeds at your local grocery store, near the nuts, almonds, etc. I hope you love this granola, Lori! Please let me know how it turned out if you try it! Great minds definitely think alike, Izzy! I have several cans of pumpkin stashed in my pantry because I go through it so quickly! It's one of my favorite things to bake with. Thanks so much for the granola compliments! I can't wait to see your recipe! I would expect nothing less than for you to have started in August! This granola looks delicious and I love the pumpkin tin! Does your pumpkin actually come in a container that cute?! Geez we just have Libby's around here! ;-) Pinned! Thanks, Lindsey! Ha ha no...my pumpkin comes from Libby's, too. This pumpkin tin is actually from Michael's craft store! :) Thanks for the granola love! I hope you love this granola, Ashley! OMG!! this granola looks awesome Gayle.. I am totally making this.. Yumm! This granola is amazing, Arpita! Definitely full of pumpkin flavors. I hope you love this if you try it! I need some of this fantastic granola in my life ASAP!! :) It would make a great topping for so many things! Pinned! I love this granola over ice cream and in yogurt, it's just SO good! Thanks so much for the pin, Jocelyn! This. Looks. Divine! I'll add this to my list of other fall-flavored favorites to make this weekend! I hope you love this granola, Michelle! Please let me know how it turned out if you try it. And thanks so much for stopping by! oh dang! I need this for breakfast! It makes the best pumpkin breakfast! YUM! I was thinking this morning that I needed to find a pumpkin granola recipe and here it is! Can't wait to try this out over some Greek yogurt! I'm so glad you found this recipe, Elizabeth! It is definitely my favorite granola, so full of pumpkin flavor! Thanks so much for stopping by! This is one impressive granola! I love all of the ingredients, and also the color! I love making big batches and giving granola as gifts. So much better than store-bought. Agreed! Thanks for the kind words and for stopping by, Mimi!